Manny Machado and the Orioles boast tremendous power, but Baltimore's lineup has a huge task in trying to make up for a paper-thin starting rotation. This week, SI.com is previewing all 30 MLB teams for the 2016 season, counting down to the No. 1 team in the league. At No. 26: the Baltimore Orioles. On the heels of a modest season that many feared would be the last in Baltimore for first baseman Chris Davis and catcher Matt Wieters, the Orioles managed to retain both this winter thanks to Davis signing a contract with a significant amount of deferred money and Wieters joining the first wave of players to accept a qualifying offer. Davis, who rebounded to 47 homers last year after restoring his therapeutic use exemption for an ADHD drug, should continue to lead a power parade that includes third baseman Manny Machado (35 homers), centerfielder Adam Jones (27 homers) and second baseman Jonathan Schoop (15 homers in 86 games) as well as newcomers Mark Trumbo (22 homers despite a partial-season exile in Seattle) and Pedro Alvarez (27 homers with Pittsburgh). At worst, only one of that aforementioned pair of new Birds will have to play the field at any given time, minimizing the damage they can cause. Of that group, the biggest promise belongs to Machado, who is coming off a season unencumbered by knee woes and put up across-the-board career bests: .286/.359/.502 with a 131 OPS+, 20 steals to go with those homers, and 7.1 Wins Above Replacement (baseball-reference.com version). He doesn't turn 23 until July 6, so it's entirely possible that the best is yet to come from him. 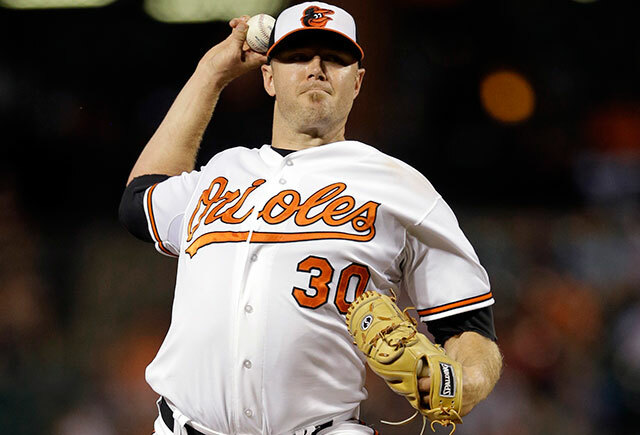 Meanwhile, the team also retained reliever Darren O'Day, who has paired with closer Zach Britton to become the game's most valuable one-two bullpen punch over the past two seasons. Manager Buck Showalter's use of that duo and his facility with handling the rest of his bullpen should help mitigate some of the question marks in the Orioles' rotation. Even in a division that's decidedly short on top-shelf starting pitching, the Orioles' rotation scares nobody. Their only starter to qualify for the ERA title and turn in a mark below 4.00, lefty Wei-Yin Chen, skipped town and is now a Marlin. The team's fussing with former top prospect Kevin Gausman and the decline of Chris Tillman have raised questions about the way Baltimore develops pitching from within. Both Ubaldo Jimenez and Yovani Gallardo probably have their best days behind them, and Miguel Gonzalez's terrible peripherals have finally caught up to him. On the offensive side, for all the power that the team boasts, getting on base could be a real problem. Trumbo and four returning starters (including catcher Caleb Joseph, who may well catch more games than Wieters) are coming off seasons with on-base percentages of .310 or lower, and there's no guarantee they get more than that from their collection of question marks in leftfield (Korean import Hyun-soo Kim, Rule 5 pick Joey Rickard and veteran holdover Nolan Reimold). Over the past half-decade or so, the Orioles' track record in converting their blue-chip pitching prospects into viable major leaguers leaves something to be desired. Jake Arrieta needed a trade to Chicago to unlock his potential; Britton and lefty Brian Matusz had to move to the bullpen; and Dylan Bundy and Hunter Harvey have been derailed by injuries. Tillman was the exception to the rule for 2 1/2 seasons, pitching to a 3.42 ERA (118 ERA+) from mid-2012 though '14, earning All-Star honors in '13 and topping 200 innings twice despite a gaudy home run rate of 1.2 per nine. Alas, his shaky peripherals—which produced a 4.22 FIP over the span in question—caught up to him in 2015, less in the form of his home-run rate than in his converging strikeout and walk ratios. Where he had whiffed 7.1 per nine and walked 2.8 in those 2 1/2 seasons, he slipped to 6.2 strikeouts and 3.3 walks per nine in 2015. He finished with a 4.99 ERA, second-highest among qualified AL starters, and a 4.45 FIP. One reason for his collapse may have been mechanical. As Baseball Prospectus 2016 noted, "Tillman has had one of baseball's tallest release points for the past few years, reaching almost seven feet of vertical distance, but in 2015, the arm slot dropped to a release four inches lower." That's Schoop's strikeout-to-walk ratio; he whiffed 79 times in 321 plate appearances and drew just nine free passes for the majors' highest ratio. As bad as that is, it does represent a slight improvement over his 2014 ratio of 9.4 (122 strikeouts and 13 walks in 481 PA). Not many players can get away with that kind of imbalance, but at least for the moment, the 24-year-old Schoop still offers plenty of promise thanks to his combination of power (32 homers in 817 PA at the big league level) and defensive ability (+10 Defensive Runs Saved at second base in 2014, though down to -3 last year), which has drawn positive notice from scouts.